At less than one full season in Major League Baseball, Yasiel Puig has turned into a full-fledged rock star. He’s hit walk-off home runs at home for the Dodgers; been arrested for driving 110 mph in Miami; and been benched numerous times for careless play and irresponsible behavior. In that respect, he’s more rock ‘n’ roll outlaw than Beatles 1963. Nonetheless, ask any baseball fan who they would like to see play most and you’ll hear the majority answer, “Yasiel Puig, please.” ‘Puig Fatigue’ is unlikely to set in any time soon. Just when you think he’s become the grown-up ballplayer your grandpop would respect, he forgets where he is at Citi Field and nearly drills his teammate with a throw after the inning had ended; just when you think it’s time for a hug, Adrian Gonzalez can be seen yelling at Puig outside the dugout. In other words, the Puig train will keep rolling as long as the Dodgers right-fielder stays healthy. Here are five reasons baseball fans are hoping it doesn’t stop. Everyone has seen what one-dimensional players can do. Hitting 50 home runs or playing great defense is nice, but what about a player that can make diving catches, gun down runners at the plate, steal bases, and hit .335 at the same time? Puig’s untamed athleticism makes these feats capable, often within the span of a few innings. Baseball fans are getting a feel for what it was like to watch Willie Mays play in his prime. MLB superstar Mike Trout is so polished you can forget the otherworldly ability lurking underneath his exterior. With Puig, it’s often his mistakes that deliver the most excitement. In that respect, it is almost too bad Puig plays for a contender. If he were allowed to unleash his athleticism without regard for winning ball games, the Puig show would reach even more epic heights. Puig’s bat flips have already commandeered their own corner of the Internet. It doesn’t matter if Puig is hitting a home run, launching a ball bound for the gap, or hitting a routine fly to center — there’s usually a dramatic bat flip coming along with the package. 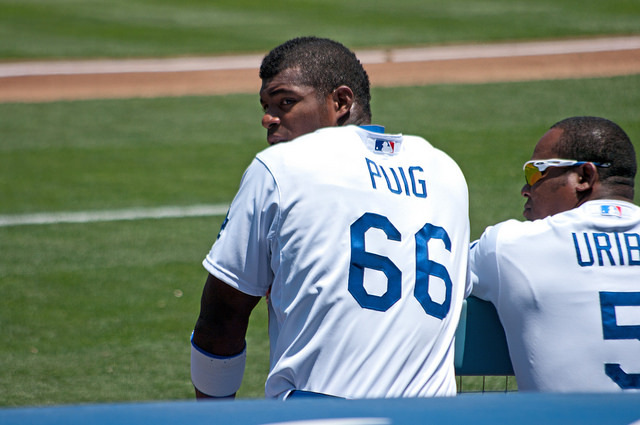 Detractors find their biggest beef with the Puig show on this point. Showboating may be more common in 2014, but baseball’s gentlemanly rules still do not permit showing up pitchers while they’re standing on the mound. Nonetheless, there’s a reason why publications compile lists of Puig’s top five bat flips even though he hasn’t even clocked a full MLB season. Baseball is sports entertainment, correct? In that respect, Puig owes his full flamboyance to the world of baseball. He may be cheerleading on third base against a respectful Cardinals team in the postseason, but who cares — he’s providing equal parts joy and aggravation. For those who believe Puig is an egomaniac with no regard for anyone, his moments of childlike vulnerability are enough to give pause. Puig genuinely seems to regret his mistakes and, when punished, sulks like an obedient child who has disappointed his parents. His humanity and openness are as uncommon as any other aspects of the Puig routine. Baseball’s heroes are classically stoic. Think Lou Gehrig saying goodbye to the world while counting himself lucky, or Roger Maris being forced by his teammtes to take the game’s first curtain call in history after breaking Babe Ruth’s home run record. These guys rarely emote, and there’s no crying in baseball. Puig presents a different version of the baseball hero for the twenty-first century. Puig has become a much more patient hitter in 2014. In fact, he’s improved his pitch selection so much he is leading the Dodgers in on-base percentage and walks. He’s also learning how to exert more self-discipline without the bat, which has led to fewer errors in the field and mistakes on the basepaths. Yet you can’t become a complete player overnight. Part of the must-see factor surrounding Puig is his growth stages. He’s getting better before your eyes, but you know there are still going to be lapses back into the raw rookie fans first encountered in 2013. There’s no question the development narrative has its appeal for fans. Puig’s lapse during a May contest at Citi Field (shown in the video above) illustrates this point. After uncorking his throw from right field following the third out, Puig tried to play it off with teammates. Later on in the dugout, the situation turned into high comedy when hitting coach Mark McGwire could be seen pantomiming “one out … then, two outs … you understand what I’m saying?” to Puig in a combination of frustration and amsuement. It’s amazing to watch Miguel Cabrera bat and boring to watch him play in the field. Five-tool players are rare in baseball, so Puig’s maturity is both a blessing to the Dodgers and the sport alike. He now leads his team in batting average, OBP, OPS, RBI, and walks. Puig is outplaying Hanley Ramirez, Matt Kemp, and Adrian Gonzalez in a legitimate MVP campaign through 50 games. Meanwhile, his spectacular outfield play — save a few blips here and there — has made manager Don Mattingly a happy man. Donnie Baseball acknowledged the Cuban star had yet to achieve perfection, but cited Puig “wanting to improve” as the sign he’s grown from a year ago. There are still going to be moments when fans experience Puig Fatigue, yet there is no player more thrilling at the two sides of the game. Keep Troy Tulowitzki or Mike Trout for exquisite, drama-free days at the ballpark. Take Yasiel Puig for must-see baseball with all the epic mistakes included.